Becky Moore, age 65, has led a very active, busy life. She enjoys gardening, canning lots of fruits and vegetables, volunteering with the local Lions club in Hill City, plus working as a lead worker for the Itasca County District Court in Grand Rapids. 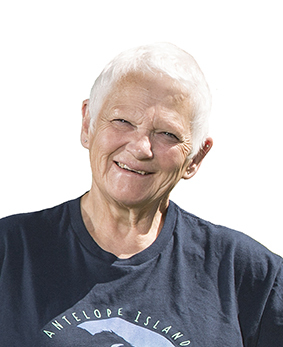 When she hit 60, osteoarthritis began slowing her down. In January 2016, Becky met with Dr. Erik Severson, orthopaedic surgeon who specializes in joint replacements and revisions, at Riverwood Healthcare Center in Aitkin. She was told she had bone rubbing on bone and needed to have a knee replacement. What impressed Becky the most about Dr. Severson is that he focuses on each patient as a person with special qualities and interests. After having a left hip replacement in July 2016, Becky was finally recovered enough to proceed with her left knee replacement in November 2017. Dr. Severson’s advice that a patient must be willing to put in the time for the recommended exercises motivated her to start knee exercises eight months before her surgery. Becky completed her outpatient therapy at Majestic Pines in Grand Rapids, where she enjoyed using the therapeutic pool. She surprised her therapist with the extent of her new knee’s flexibility and range of motion. Getting back to activities she enjoys, Becky did the Hill City Fun Run 5K on July 4, 2018. The last time she had run it was three weeks before her hip surgery in 2016.